We lay out 6 necessary sections for your one-page business plan and why you need them. From an industry analysis to a marketing plan, we'll soon have you on the way to a successful business future. A sales business plan focuses on just that--sales. It also touches on your sales goals, who your target customer is, how you’ll market and sell your product or service to that customer--and it's essential to have if you want your business to be successful. 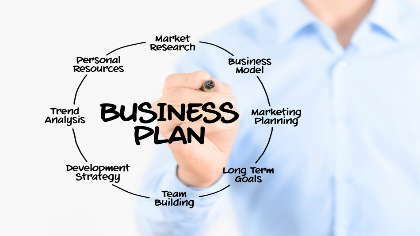 Below are the sections of what your business plan should include. The executive summary is an important section. It needs to immediately draw readers in--if they don’t like what they read at the very beginning, they won’t go any further. It needs to include what your company does, why you are unique and why you’re going to succeed. Here you should also include the company’s financial projections (expected revenues, expenses, and profits) for the next five years. The overview provides a brief history of your company, including when the company was formed and any key milestones or accomplishments the company has achieved. This shows potential future success. In the industry analysis you will discuss both market overview and relevant market size. The market overview discusses characteristics and size of your market. The relevant market size more specifically focuses on what your annual revenue would be if you had 100% of the market share. The customer analysis section focuses on your target customers and customer needs. Here you will identify your current and/or future customers including as much demographic data as possible. You will also specify why your existing and future customers want or need your product or services. In the competitive analysis section you’ll discuss your direct and indirect competitors, as well as your competitive advantages. Your direct competitors are businesses that offer the same exact product or service to customers that you do. Indirect competitors are businesses that offer a different product to fill the customer’s need. Here you will list who the direct and indirect companies are, and their strengths and weaknesses. Most importantly, in this section you need to identity what you have that the direct and indirect competitors don’t have that make you stand out and what will help you win the customer over them (your competitive advantages). Your marketing/sales plan section will discuss your products/services, pricing, promotions/sales plan and distribution plan. Here you will give the details of the products/services that you company offers along with the detailed pricing information. You should also include how your pricing is compared to your competitors. The promotions/sales plan will be a detailed plan on how you will attract new customers. Will you advertise on the radio, social media or newspaper? Your distribution plan will show the different ways that customers can make purchases from you. Can they buy directly online from your website in addition to a brick and mortar store or do you have salesmen that make door-to-door sales? Lastly, develop a one year sales forecast/projections based on how you will be obtaining new customers and retaining your existing customers. Although it seems like a lot of information, you should make this short and sweet and try to keep it to one page. Writing an effective business plan will help you have a successful future for your business. What Should a Business Plan Cover?